A quality baby bedding set is essential in making your nursery warm and inviting. All Cotton Tale patterns are made using the finest quality materials and are uniquely designed to create an elegant and sophisticated nursery. 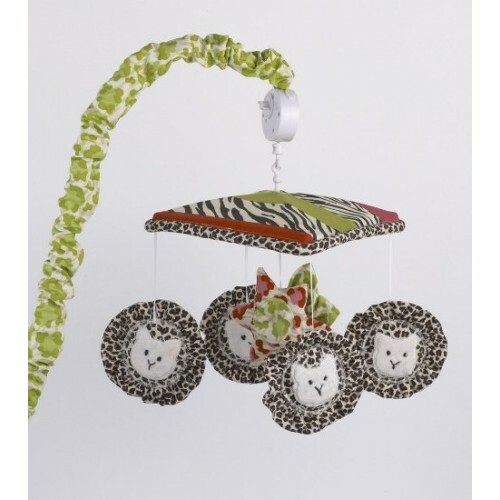 Here Kitty Kitty musical mobile has four little kitty's in cheetah skin dancing around a bright pink flower. Canopy in tiger stripe with bright green arm cover. Wind up mechanism plays Brahms Lullaby. Basic assembly required. Mobiles are not toys, remove from crib when baby starts to sit up unassisted. Spot clean only. Mobile for girls nursery.